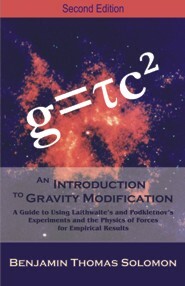 An Introduction to Gravity Modification, Second Edition is the result of a 12-year (1999-2011) study into the theoretical and technological feasibility of gravity modification, that presents the new physics of forces by replacing relativistic, quantum and string theories with process models. Gravity, electromagnetism and mechanical forces are unified by Ni fields, and obey a common equation g = (tau)c^2. Gravity modification is defined as the modification of the strength and direction of the gravitational acceleration without the use of mass as the primary source of this modification, in local space time. It consists of field modulation and field vectoring. Field modulation is the ability to attenuate or amplify a force field. Field vectoring is the ability to change the direction of this force field . This book reaches out to a wider audience, and not just to the theoretical physicist; to engineers and technologist who have the funding to experiment; just as Arno Penzias and Robert Woodrow Wilson experimented with the Holmdel Horn Antenna and discovered the microwave background radiation. The mathematics is easier than that taught in theoretical physics and therefore accessible to a wider audience such as these engineers and technologists. Benjamin Solomon is CEO and Principal Investigator, iSETI LLC (Interstellar Space Propulsion Technology Initiative), the corporate vehicle for the 12-year (1999-2011) research into the theoretical & technological feasibility of gravity modification.